Students at the University of Montana are solving some of the world’s most pressing issues. I like to think of UM as Missoula’s own think tank. 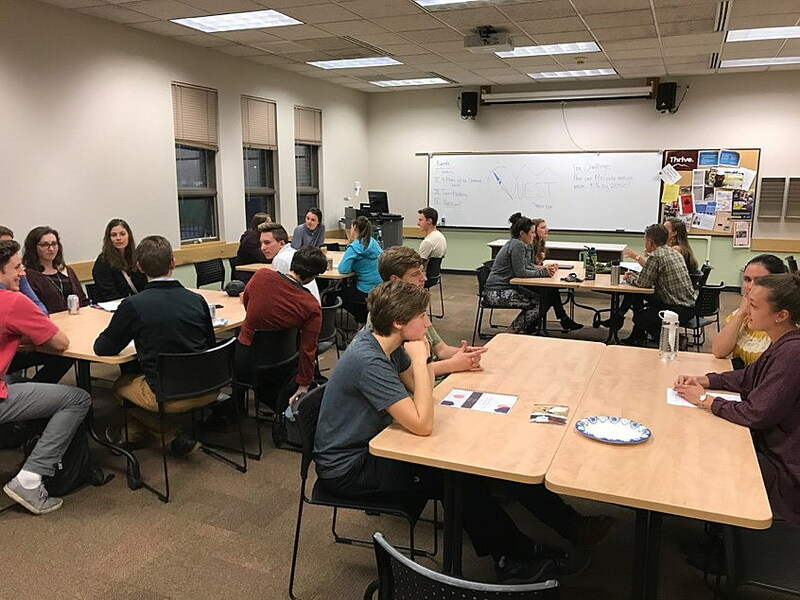 The University of Montana and Davidson Honors College are filled with intelligent and creative students and faculty from myriad disciplines ready and willing to help solve some of the major challenges of today from affordable housing to sustainability. In 2016, two Davidson Honors College students, along with the dean and representatives from the City of Missoula, collaborated to develop a program that harnesses some of that intellectual horsepower and sends it back out into the community. Through this partnership, Questions for Undergraduates Exploring Social Topics, or QUEST, was born. This year, nearly 20 Davidson Honors College students from majors across campus, ranging from freshmen to seniors, are working on the second annual QUEST challenge: to develop a proposal for the City’s ZERO by FIFTY Pathway to Zero Waste effort. The winning team will receive a scholarship and an internship with the City to help advance the City’s goal of reducing landfill waste by 90 percent by 2050. I have had the joy of working with students and leading both the academic and administrative component of the QUEST program for the last two years. This year, the budding ideas our six teams will present to a panel of judges in April include ways to promote composting, recycling, reuse and more across campus and into the community. Our teams are addressing Missoula’s Zero Waste goal using the four ZERO by FIFTY pathways: access, infrastructure, education and policy. Through their course work, they are looking at different approaches globally, nationally and locally by reviewing case studies and exploring challenges they may face in implementing a plan. It has been thrilling to watch the student perspectives evolve and change over the past short months. They are changing their own behavior as it relates to sustainability and looking what will be most feasible to expand upon in the City’s already robust plan. One team has implemented a personal Zero Waste policy, while other teams are planning to educate their peers about upstream sustainability options for businesses, for example, while others are proposing local policy measures. QUEST participants will share these concepts with fellow students and other members of the Missoula community. With QUEST, students continue to learn how to apply their classroom experiences in a hands-on way with a real impact beyond campus. Kaetlyn Cordingley is Interim Director of Davidson Honors College at the University of Montana. December 3. Weather, Climate and Our Watershed. Clark Fork Coalition scientists will discuss how this winter’s forecast & long term climate predictions will affect our watershed – and how we can build resiliency for our river. Conflux Brewing Co., 200 E. Main St, Missoula. 6 p.m.
December 6. Climate Smart Missoula’s Year 3 Celebration. Help celebrate 3 years of Climate Smart Missoula! Food, beverages, and annual Smarty Pants awards honoring folks who have made an impact on local climate action this year. Goodworks Ventures, 129 W Alder, Missoula. 5 – 8 p.m.